Here’s a picture of what boaters found on on the River Sun. Feb. 22. It's not snow. Memphis and the state of TN should look better. Click below to see what the Maynard C. Stiles Discharge permit and the TN water quality for recreation require and comments concerning the foam problem from the TN Dept. of Environment and Conservation and the Maynard C. Stiles Waste-water Treatment Facility. There shall be no distinctly visible floating scum, oil or other matter contained in the wastewater discharge. The wastewater discharge must not cause an objectionable color contrast in the receiving stream. Solids, Floating Materials and Deposits - There shall be no distinctly visible solids, scum, foam, oily slick, or the formation of slimes, bottom deposits or sludge banks of such size or character that may be detrimental to recreation. James H. Baker, Project Director - TN Water Sentinels, says the foam detracts from a clean riverfront and participating in healthy outdoor recreation on the Mississippi River and Wolf River Harbor. It also gives Memphis a negative image of "we don't care what our riverfront looks like" to its citizens and tourists that come downtown to marvel at one of the largest rivers on Earth. ...we found out that the reported foaming episode apparently occurred at the time of a malfunction of the defoamer for a day or so during cold weather. They had been, and apparently still are, de-foaming successfully. 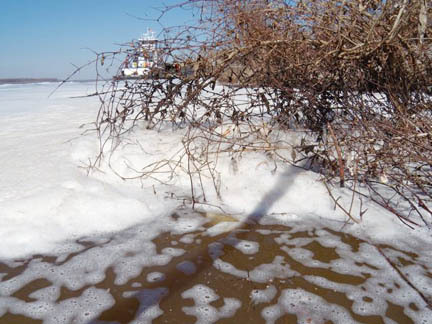 In answer to our inquiry yesterday morning (2/23), they reported that they've noticed a decrease in de-foaming effectiveness on weekends allegedly due to different flows. They are requesting a different formulation from their de-foaming agent vendor in an effort to alleviate the problem. "This past weekend, Feb.21-22, M.S. [sic C.] Stiles Treatment Plant was feeding the defoaming agent at max feed rate. We are in the process of doubling our application rate. We will accomplish this by purchasing the defoamer at twice the present concentration. We hope this will dissipate all foaming at the Plant's effluent. We will be following up to determine if their efforts are successful.